Though there are countless signs hanging from the ceilings, posters on the pillars, and notes from previous readers hanging on the shelves, perhaps the most important piece of advice a Powell’s City of Books customer may need doesn’t seem to be advertised: breathe. Underneath the sign are bike racks bearing the titles of cyclist-related books for the Pearl District’s sustainability-focused consumers, as well as the main entrance to the 68,000 square-foot space with its 1,000,000 volumes. This entrance deposits you into the welcoming Green Room, and another set of doors on the northwestern storefront leads to the Orange Room. These two rooms are also the only locations with registers, which forces the customer to shop solely in the rooms with the least amount of books, or to embark on an adventure. Powell’s City of Books is split into nine color-coded rooms on three floors, as well as a customer service desk responsible for the books on hold on a fourth floor. With its rows of plain pine shelves towering twelve feet high over a cement floor, the store retains the industrial feel permeating the district’s architecture. Even the recent renovations have only enhanced the unique Powell’s experience, not made that experience feel similar to a trip to Barnes & Noble. The Green and Blue rooms, for example, received facelifts that addressed leaking roofs, energy inefficient windows, and poor lighting, but the construction exposed elements of the previous car dealership that have since been incorporated. Likewise, new rainbow carpeting has been installed in the Rose Room, which appeals to young readers without excluding other customers. The only exception to this stylistic rule is the Rare Book Room, which trades pine shelving for darker woods, and which seeks elegance with comfy, antique furniture pieces to settle into, and tasteful artwork. This is also the only area with its own hours and appointments. However, unless you want to take the easy (boring) way out and take the elevator straight to the Rare Book Room, you need to traverse through the rest of the labyrinthine store first. Just as Michael and Emily Powell and their staff are not there to dictate what you should read, they don’t emphasize any “right” path. Though the rooms have general themes, the maze-like layout encourages customers to explore a variety of topics as they move through the store, rather than directing certain demographics to certain areas. The interactive floor plan below offers one option for navigating the space. If you start at the Green Room, you’ll find that it is home to bestsellers, award-winners, and staff picks. Though readers are encouraged to lose themselves in the shelves, this room still offers a pleasant book-buying experience to those with a budget or a time limit. The Blue Room may seem the most “literary” for those with more traditional tastes, for it contains categories such as classics, drama, poetry, memoir, and journalism. However, Powell’s does not place less value on popular fiction than on those works in the “literature” section. Rather than sending the fantasy nerds to hide in the back, the adjoining Gold Room invites those who had just been perusing Euripides to explore Eiichiro Oda instead; the shelves are stocked with manga, erotica, horror and mystery novels, westerns, and even nautical fiction. The aptly named Coffee Room features the World Cup Coffee & Tea shop, but though the seating area offers a chance to re-energize, the shelves of graphic and romance novels guarantee you never forget you’re in a bookstore. The Orange Room offers a combination of cooking, gardening, humor, film, and musical works. This is also where thousands of used books are sold to Powell’s each day, as well as where customers can purchase souvenirs. The inclusion of such spaces complicates the chain/independent bookstore divisions that Laura J. Miller observes in Reluctant Capitalists: Bookselling and the Culture of Consumption. 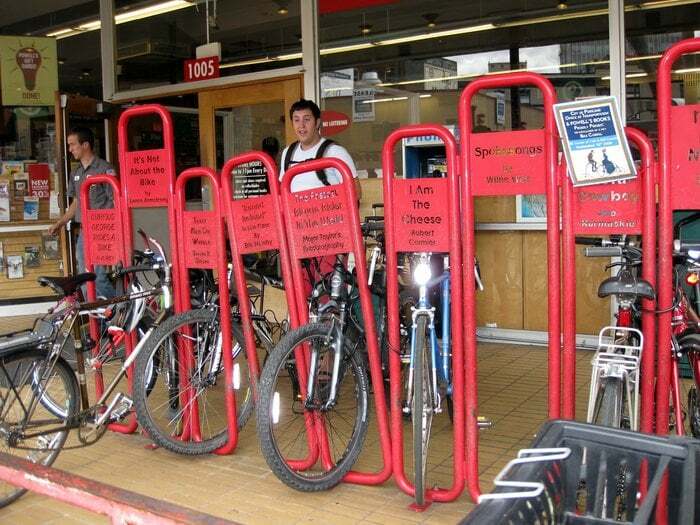 However, she also notes, “Larger independents…stress their connections community, usually emphasizing their embeddedness in and commitment to a locale” (121), and as a Portland staple, Powell’s City of Books connects the locals. When they choose to grab their morning coffee from the cafe or to use their Powell’s tote at the grocery store, they advertise their participation in a community founded on the sharing of ideas without pretension. Moving on, the Rose Room is perhaps the most family friendly room, for it caters to children, guardians, and even family pets with its books on parenting and children’s and young adult sections. As you ascend to the second floor, you will come across the Espresso Book Machine and special interest books in the Purple Room. Here, equal attention is paid to topics like investing, dance, philosophy, and self-help. The adjacent Red Room takes a different, “worldly” approach, offering books on diversity and travel, with topics ranging from Americana, to gay and lesbian literature, to transportation. The massive collection of used and new books, magazines, and other “things” at Powell’s City of Books is shared with the Portland community. As Bruno Latour notes, “A thing is, in one sense, an object out there and, in another sense, an issue very much in there, at any rate, a gathering” (2288), and each book on each shelf is a matter of fact – a physical object with a economic value – and a symbol of much more. The alleys of shelves allow customers to privately experience the books they peruse and the topics they seek out, but the layout of the store eventually forces them to encounter fellow book-lovers. The helpful (though not intrusive) staff are also there to offer guidance and discuss ideas. 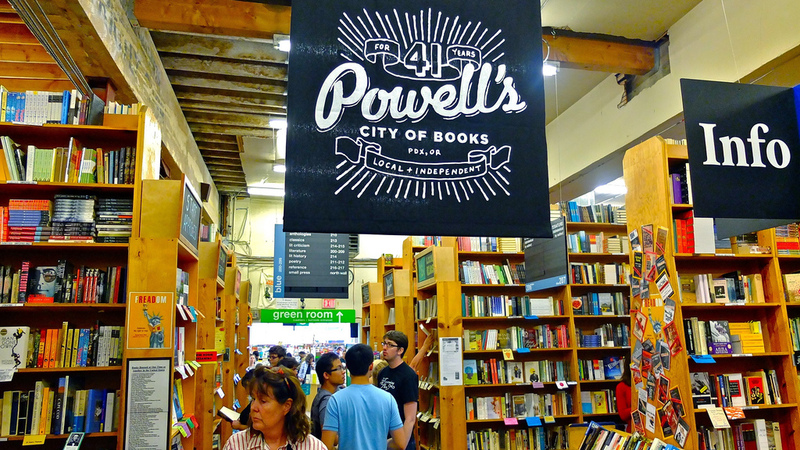 Thus, the books, and even the Powell’s water bottles, socks, and onesies, become things around which the Portland community is able to gather and advance the Powell’s mission. Latour, Bruno. “Why Has Critique Run out of Steam?” The Norton Anthology of Theory and Criticism. 2nd ed. Ed: Vincent B. Leitch. New York: W.W. Norton & Company, 2010. 2282-2302. Miller, Laura J. “Serving the Entertained Customer.” Reluctant Capitalists: Bookselling and the Culture of Consumption. Chicago: University of Chicago Press, 2006. 117-39. Smith, David Hale. “Return of the Great American Indie Bookstore.” American Way. Dec 2015. p. 81.